Valentine’s Day is the most divisive Hallmark holiday in terms of public opinion. For those who do have someone to share the day with—be it a special someone, good friend, or family member—the day can be a cheery experience full of lighthearted candy exchanges, kisses, or even candlelit dinners. But for those who (like me) haven’t tricked someone into loving them, the day can leave a bitter taste in their mouth, with its only solace coming from the discount candy that will hit the shelves the following day. It can be a very frustrating time watching friends slather your time around them with serious cases of baby-talk and public displays of affection. The smell of love in the air can make your heart swell with joy, or wither into a husk small enough to make the Grinch himself jealous. Well listen up, you Grinches and Scrooges of Valentine’s Day, because I have just the thing to turn your longest friend-couple sour: board games. But not just any board games. I present my top five board games to ruin love for Valentine’s Day. Love Letter happens to be one of my favorite “pocket games,” meaning it’s a small-packaged game that has little to no setup and is easy to play. It’s great for beginners, but not for the faint of heart. I would describe it as an aggressive game of Go Fish—all it takes for your special someone to knock you out of the game is one lucky guess or card draw. This game comes with a sweet and innocent design, but it’s easy to become enraged when you lose at the hands of a loved one. This is one the most prolific board games of our generation. 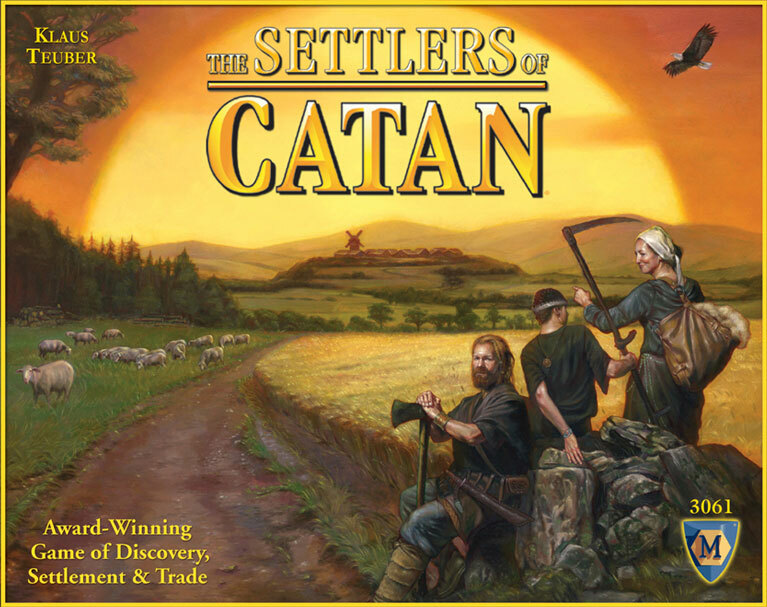 It features the players acting as settlers of the island of Catan who barter the resources they harvest from their starting locations with others in order to expand their villages. The key to winning this game is also what tests the boundaries of a couple’s relationship: you need combinations of stone, wood, sheep, wheat, and brick in order to build your village, and to get everything you need, you must convince others to trade with you. The burn of your loved one denying you the sheep you need is heart-wrenching. Settler beware. Sheriff of Nottingham is one of my favorite games, and it comes with a serious amount of bartering, lying, and vengeance. As described in my standalone review, it has players taking turns acting as the sheriff, who inspects merchants’ bags for illegal goods but can be bribed to look the other way. This is where you can feel a sharp knife in the back. A friend or loved one can easily tell you they won’t inspect your bag of goods but the, when it comes time to step forward, tear your bag open and fine you for all your worth. By the end of the first turn, the players have learned to trust no one and only look out for themselves. Good luck staying friendly with snookums when they keep robbing you. Here is a heavy hitter when it comes to paranoia and desperate thinking. Players act as Knights of the Round Table and spend up to five rounds being sent out on quests; the attending knights get a “pass” or “fail” card depending on whether a quest is successful. The catch to all this is that some of the knights are actually traitors, allied with the forces of evil. The traitors keep their identities secret from the other knights and try to convince the others to send them on quests for them to sabotage. The players know from the get-go that there is evil among them, which give the others no reason to trust anyone. What better way to split couples apart, am I right? Monopoly. Nowhere will you find a more wretched hive of scum and villainy than in Monopoly. This game is flawed on so many facets it’s hard to know where to begin. There are two types of people who play monopoly: those who know the rules and those who say they know the rules. Those who know the rules prey on those who don’t and use their advantage on the ignorant. Those who think they know the rules, but actually don’t, waste everyone’s time with arguments over free parking and auctioning. They will spend the whole time playing blindly until one of their claimed rules conflicts with their benefits, and then they will spend 30 minutes looking in the rule book (if you are blessed enough to have one) to find a loophole. And don’t forget the banker. The banker is worst of all—never trust anyone who appoints themselves as the banker, as they will make change for a 20 with three 10s. Everything about this game will tear love apart: someone rolling doubles twice in a row and buying Boardwalk, going to jail, not getting being the race car, all of it. And God have mercy on the poor fools who are friends with the person who just got the Nightmare Before Christmas edition or whatever other version and beg—or demand—that you play with them, for they will take your soul through a tortured journey with a smile on their face.